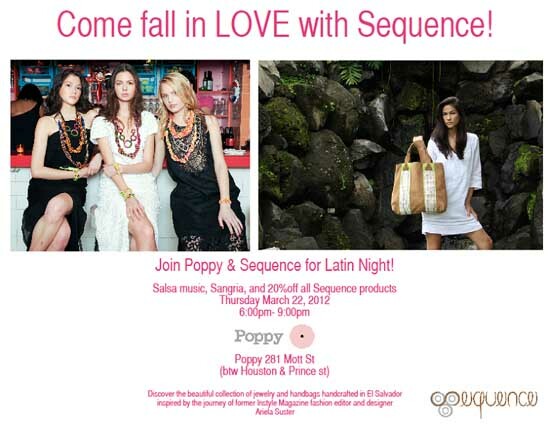 NEW YORK, Mar 20, 2012/ — Salsa music, sangria and 20% off all Sequence products, SEQUENCE’s Latin Night at Poppy promises to be a night to remember. SEQUENCE was founded by renowned fashion stylist and El Salvador native Ariela Suster. Suster is proud to introduce the beautiful craftsmanship of her home country to the world with a Spring 2012 collection that draws inspiration from El Salvador through design, color, material, and origin.